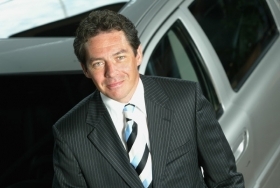 Steven Armstrong joined Volvo in 2001 as senior vice president of purchasing. (Bloomberg) -- Steven Armstrong, chief operating officer of Volvo Cars, will leave the Swedish automaker to join former employer Ford Motor Co. as part of a management reshuffle under new Volvo CEO Stefan Jacoby. Armstrong, 46, will return to Ford of Europe, Volvo said a statement. Volvo also named Freeman Shen as head of its Chinese operations. Shen was adviser to Li Shufu, chairman of Zhejiang Geely Holding Group Co., which bought Volvo from Ford last month. Jacoby wants to double Volvo's global sales to 800,000 cars in 10 years. China, where Volvo aims to build local production plants, has the biggest growth opportunity, while the carmaker also needs a long-term U.S. strategy, Jacoby said at the Paris Motor Show. Volvo sold 334,808 cars worldwide last year, a decline of 11 percent from 2008 and 27 percent from a peak of about 460,000 in 2007, according to the company. Volvo said its restructuring includes making the heads of product development, production, purchasing and quality report directly to Jacoby instead of to a chief operating officer, a position the carmaker has eliminated. The new management must “broaden the product range and appeal to a wider audience to improve their market share and volume,” Jonathan Poskitt, an analyst at J.D. Power & Associates in Oxford, England, said in a phone interview. Volvo has suffered from being a “near-premium brand,” a market that has been squeezed in recent years by expanding premium makers as well as volume manufacturers, Poskitt said. Armstrong joined Volvo in 2001 as senior vice president of purchasing. He's been COO since 2006. Before Volvo, he was vice president of purchasing at Auto Alliance International, a joint venture between Ford and Mazda Motor Corp.
“I'll be working on a couple projects they have going in Europe in the near term,” Armstrong said in a telephone interview, adding that he will be working with Ford of Europe's new head Stephen Odell and CFO Stuart Rowley. Before joining Geely last year, Shen headed Fiat Powertrain Technologies in China from 2007, Volvo said.